Go Rubbish Go. provides rubbish clearance in Bromley, BR1 that utilize our professional waste disposal skills to rid you of all of your unwanted junk. Whether you need to clear space in your property, are in need of garden waste clearance or perhaps even office clearance services – we can do the job for you. Our team of expert staff is trained in the skill of carrying and manoeuvring heavy furniture and equipment and know the best method to dispose of different types of materials. By hiring our Bromley waste removal services, you will save yourself money that may otherwise be wasted on skip hire and applying for a skip permit. How much do you charge for Bromley rubbish removal services? 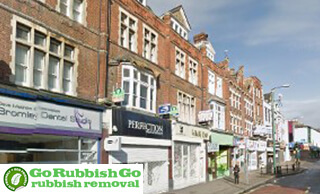 For more info you can visit our rubbish removal prices Bromley page. How much Bromley Council charge for waste recycling? For bulky waste collection prices for household waste please check this document. For trade or commercial waste price list please check this document. Where to get parking permit in Bromley area and how much does it cost? Where to apply for Bromley Parking Permit? To apply for any type of parking permit, you will need to create a permit account through the Bromley permit portal. What waste I can and can’t recycle in Bromley recycling centres? What can I recycle in my collections? This guide lists some of the common items that can be recycled as part of your door-to-door recycling collection service. Please recycle as much as you can, and place items in the correct container and leave out on your collection day. Most items can be recycled and by reducing the amount you throw away, you’ll help keep disposal and landfill costs to a minimum. Items that can’t be recycled in one of the collections below should normally be placed in your non-recyclable refuse collection. What happens to your Bromley rubbish & waste? The items that are collected together in your Bromley recycling bins are taken to a Materials Recovery Facility (MRF) where the different materials are separated both by hand and through mechanical processes. They are then transported to different reprocessors both in the UK and abroad to be made into new materials such as newspapers, plastic packaging and cans. To view the calendars for household waste collection service (Bromley Borough) visit this page. To view the calendars for green/garden waste collection service (Bromley Borough) visit this page. Calendars (Week 1 and Week 2) show what to put out for collection each week. ‘Collection days’ lists the day and week to which you are assigned. Green garden waste wheelie-bin collection calendars will tell you when to put your wheelie-bin out for collection. This guide lists some of the common items that can be recycled as part of your door-to-door recycling collection service. Our services provide not only skilled staff, but all of the waste removal equipment we need – all included in one low price. 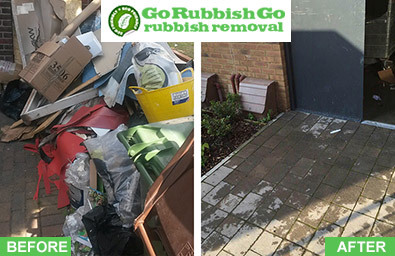 As a professional Bromley rubbish removal company, we work hard to cut our costs that are then reflected in our low prices. We do all this whilst still maintaining a very high standard of service. If you’re interested in hiring our professional BR1 waste clearance services, call us now on 020 8610 9182. We’ll be more than happy to provide more information and give you a free quote! Bromley Rubbish Removal Is Hard Work – Let The Professionals Take Care Of It! Moving property or planning enhancement to your home or garden in Bromley brings with it enough work. Why waste time clearing your old junk in preparation by yourself? Our professional waste disposal BR1 staff are fully qualified to get the job done for you, and will do so quickly and efficiently. 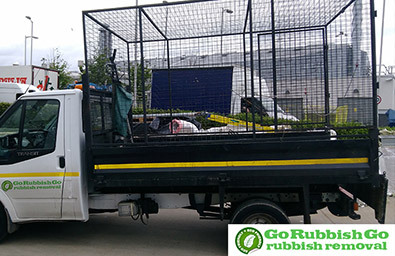 When disposing of your rubbish in Bromley, we try our very best to ensure that as much as possible is put to use elsewhere or recycled – keeping landfill additions to an absolute minimum. It is of the upmost importance to us that we work in an environmentally friendly manner, protecting the environment from unnecessary harmful waste. This has to be the best waste collection in Bromley, BR1! They worked quickly and cleared all the junk from my home in no time. Many thanks! Rubbish Clearance in Bromley, BR1 Is Quick And Easy With Our Professional Team! As a company, we appreciate the value of your time. We work on very tight schedules to ensure that not a second of your day is wasted, and that our clearance is completed quickly and efficiently without leaving you waiting around. Whether you need help clearing old electrical items, are in need of builders waster clearance or simply need help with domestic rubbish removal in the BR2 region, give us a call today on 020 8610 9182! We can then offer you more information on the waste collection in Bromley we provide. Book with us today for incredibly low prices and remarkable standards! Whether you require a same day service or someone to work to your pace and around your schedule, whether you require a one-off service or regular BR1 rubbish disposal Bromley, we are here to cater for all needs! We know that no customer is the same, so with us no service is the same either. Whatever you want from us, that’s what you can expect when you call. There is a reason that we are known as the best in the business, and that reason is that we will put you first every step of the way and work to make you happy and keep you happy. Call us on 020 8610 9182 today for a free quote, no obligation required! Bromley is one of 32 boroughs that make up Greater London. It is a large suburban town, lined with Victorian style properties. The area boasts a vast amount of green space – an unusual addition to a London district. One of the prettiest parks of the area is Bromley Palace Park. Situated behind the council offices, the park is the garden of the Bishop of Rochester’s Palace, which is a Grade II listed building. The grounds also hold a boating lake, making it the perfect place to explore on a day out in the summer, away from the bustling city. Apart from nature, Bromley offers its visitors and residents cultural experiences too. Churchill’s theatre is an attraction of the area that showcases shows from across the UK. Bromley is also home to a range of independent restaurants, as well as some of the more well-known chain eateries.